Apple Music appears all set for Google Chromecast support | What Hi-Fi? You could soon be casting Apple Music to your Chromecast streaming dongle. Apple Music could soon work with Google's Chromecast family of streaming dongles, according to the Android app's code. 9to5Google has done some digging into the app, and found numerous mentions of Chromecast compatibility. This suggests Apple is readying the feature, or at least entertaining the prospect of it. If Apple did flick the switch, it would let you wirelessly 'cast' content from Apple Music on your smartphone or tablet to a Chromecast device. It would also let you cast to Google Home devices, like the Google Home Max smart speaker. Android hasn't been a priority for Apple in recent times. While it launched Apple Music on Android in 2015, it has been slow to add new features. For example, the Android app only recently gained tablet support. 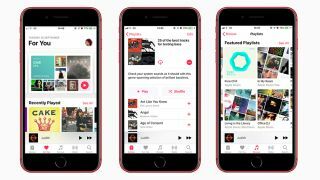 However, Apple is making its music streaming service available to more platforms. In the US, Apple Music recently became compatible with the Amazon Echo range of smart speakers and Amazon Fire TV streaming devices, and the UK will soon follow suit.